arrested in the surrounding area of Barcelona. philosophy, black clothes and some fireworks. Meco, on regime FIES 3.
they are isolated in their cells. FREEDOM IS THE CRIME THEY PERSECUTE! FREEDOM FOR THE BARCELONA 5! 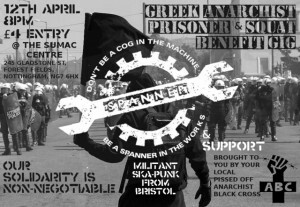 By popular demand the militant ska punk band Spanner are returning from Bristol, to play at Sumac for anarchist prisoners and liberated spaces in Greece. 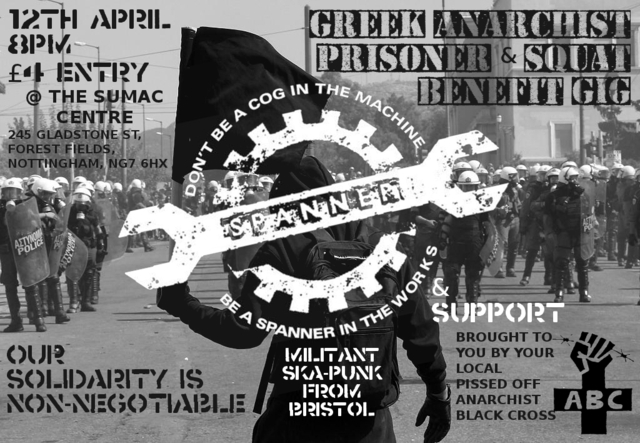 This gig is to help raise financial support for those waiting orundergoing trial due to the evictions,particularly for those of Delta squat, Thessaloniki. Our solidarity is non-negotiable. Gig starts 8pm, with a donation of £4 suggested. 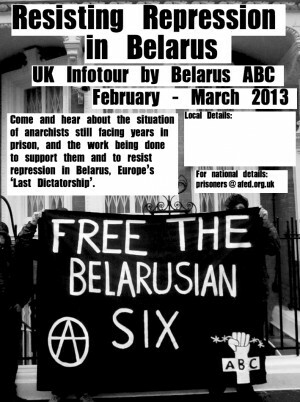 A speaker for the Belarus ABC will be over in UK from 15th February – 10th March 2013 to conduct an infotour about the continued imprisonment of anarchist comrades and others, and the severe state repression that has been going on for years. 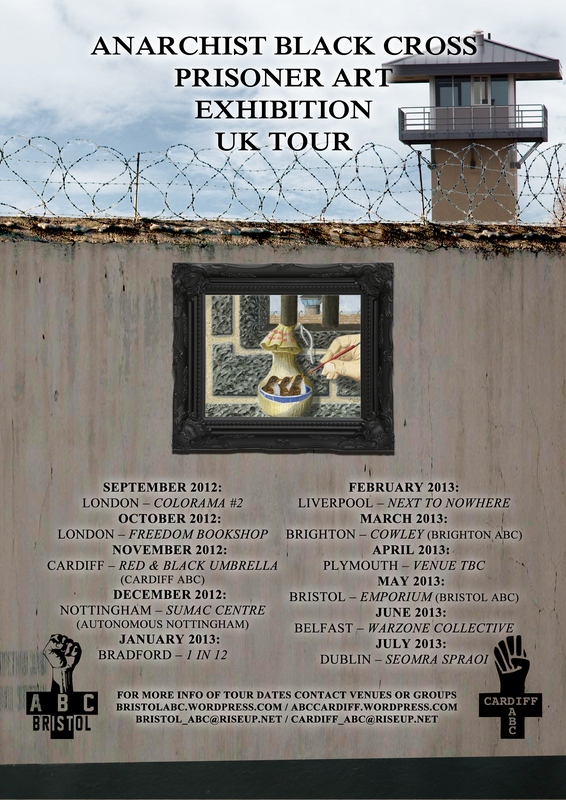 The tour is also being supported by the Anarchist Federation and the International of Anarchist Federations. 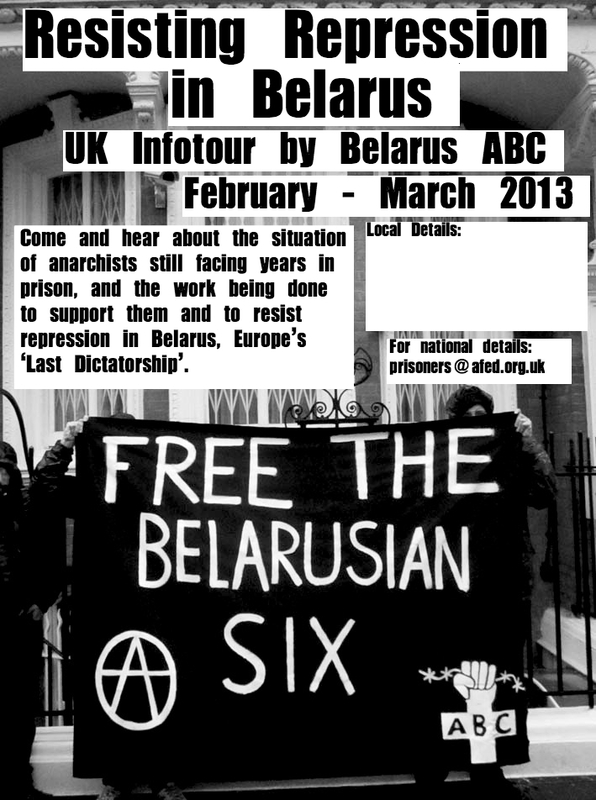 The tour will be visiting Nottingham, at the Sumac Centre, on Tuesday 5th March (245 Gladstone St, NG7 6HX). On Wed. 19 December we will be screening The Chicago Conspiracy, a documentary by Subversive Action Films which explores the legacy of military dictatorship in Chile as well as contemporary social and political conflicts in the area. 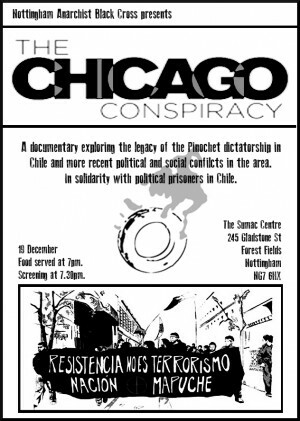 This event is organised to raise awareness and show solidarity with the many political prisoners in Chile. We will have a list of addresses of prisoners who appreciate letters of support, as well as cards to send to them. There will also be food served for donations at 7pm. The screening will start at 7.30pm. All at the Sumac Centre (245 Gladstone St., Forest Fields, Nottingham, NG7 6HX). With this tour we therefore distance ourselves from mainstream, state-funded prisoner art shows, such as the exhibition launched in London by Koestler Trust this month, campaigning instead for abolition of the prison industry and all states. Or as social prisoner John Bowden puts it: “There are frontlines of class struggle thoughout the whole of society, violent interfaces where the poor and their oppressors confront each other, and prison represents one of the most overt and undisguised frontlines of class struggle that exists.” – Solidarity without prejudice article, 2009. Phil Africa (from the MOVE family) – The MOVE 9 are innocent men and women who have been in prison since 1978 following a massive police attack on their home in Powelton Village (Philadelphia). This was seven years before the government dropped a bomb on MOVE, killing 11 people, including 5 babies. Following the cop shot dead during the August 8, 1978 police siege on Move’s headquarters in West Philadelphia, MOVE members Janine, Debbie, Janet, Merle, Delbert, Mike, Phil, Eddie, and Chuck Africa were convicted of 3rd degree murder, conspiracy, and multiple counts of attempted murder and aggravated assault. Each was given a sentence of 30-100 years and are contesting both the evidence and the fairness of the MOVE 9 trial. Peter Collins – Peter is in the 29th year of a Life 25 sentence in Canada. He completed his correctional plan in 1998, and has participated in many positive and pro-social activities while inside. Peter is currently suffering from the effects of long-term incarceration, his support committee are currently campaigning to get full parole for deportation to England. Lucy Edkins – Although Lucy’s experience of incarceration fades over 20 years into the past, the impact on her life still has reverberations today. Lucy went to art school before her imprisonment and continued to paint throughout her sentence, initially swapping pictures of loved ones for tobacco and going on to get a self portrait accepted by the National Portrait Gallery for its 1991 Summer Exhibition. In 2004 her affinity with prisoners helped her to illustrate the harrowing report charting the human rights abuses suffered by the Tipton Three at Guantánamo Bay, capturing international attention; she subsequently illustrated reports on the SIAC detainees at Belmarsh and the forced removals of asylum seekers. Her drawings of women at HMP Holloway were used to illustrate a book on suicides in women’s prisons ‘Dying on the Inside’. Currently Lucy exhibits and works for commission producing landscapes, sculptures and portraits. David Gilbert – David was a founding member of Columbia University Students for a Democratic Society and a member of the Weather Underground Organization. After eleven years spent underground, he was arrested with members of the Black Liberation Army and other radicals following an armored car robbery in 1981. He is currently serving 75 years-to-life. Alvaro Luna Hernandez Hier – Alvaro is a Chicano-Mexicano activist and political prisoner serving 50 years in prison for an alleged assault on an Alpine police officer. He has been long-time anti-police brutality and prison abolition activist, which has led to constant harassment by local and state police in west Texas. He was sentenced in 1997 for defending himself by disarming a police officer drawing a weapon on him (unarmed). The trial evidence clearly showed Alvaro was the victim of “witchhunts” and a police-orchestrated conspiracy to frame or eliminate him. Thomas Meyer-Falk – Thomas was imprisoned in 1996 for a bank robbery in aid of political projects, and since September 1998 has been in isolation in Bruchsal, Germany. He self-identifies as a “red skin”/rash (red & anarchist skinheads).